This is another project started in the mid-1990s and not completed. Clearly, even good projects are sometimes put aside. Basically, I was going to make myself a bunch of great wearable art pinafores. Note: In the States, a pinafore is called a jumper. I grew up calling them pinafores, because… well, that’s what my family called them. But, I ran out of enthusiasm when I went through a time of equating pinafores with ‘tasteful floral print dresses’ and tossed out every one of those sewing patterns. So, this project was never completed. Before I ran out of steam, I had strip pieced the front bodice shown above. It’s beaded by hand, and also embellished with some ‘crazy quilt’ stitching. 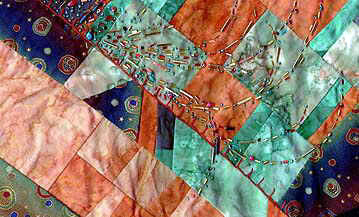 A lot of my fabric art embellishments have been inspired by the stitches on crazy quilts. I rely on Judith Baker Montano’s book, Elegant Stitches, shown in the right column. I’ve used her fabric art as references ever since I bought a copy of her hand-drawn notes that she’d photocopied to sell at quilt fairs in the 1970s. I like to mix easy strip piecing with quirky color combinations, crazy quilt stitching, and glass beads… especially bugle beads and small seed beads. For me, fabric art is about color and texture. The mix of fabrics, stitching and beads is, in my mind, a perfect combination for personal art expression. At Home: Jewelry: Crazy Quilting.